Following a long tradition of first ladies, Michelle Obama has written a memoir looking back on her journey to the White House. But just as she recast the mold of first lady as the first black woman to hold the office, Obama’s Becoming advances the genre, pushing at its edges and arriving somewhere new. 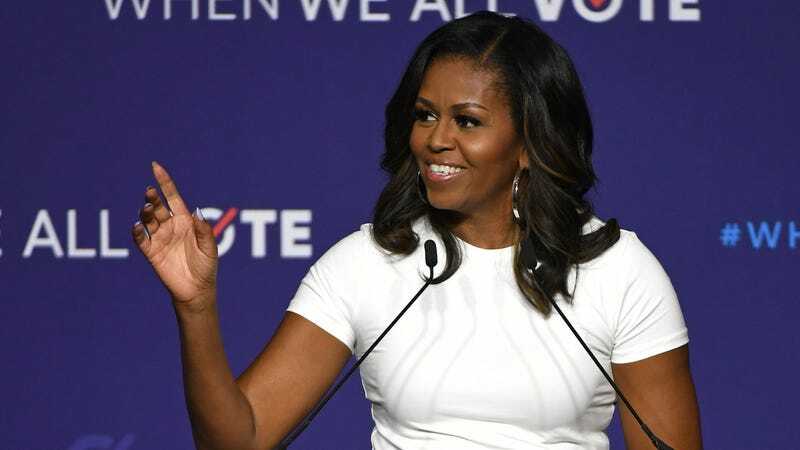 More than just a memoir, Becoming seems written to take control of the narrative the public has built around her, walking the fine line of diplomacy required of first ladies while discussing the personal struggles she faced as a black woman moving into spaces that were not designed for her. It’s a self-aware, vulnerable, and often funny retelling of her life that doubles as a roadmap for women and girls who are similarly navigating unfamiliar territory, even with potentially lower stakes than the White House. While the public knows the general arc of her life—growing up on Chicago’s South Side, culture shock as she arrives at Princeton and finds herself among a mostly white student body, meeting Barack while working at a prestigious law firm, navigating life in the public eye as the first black family in the White House—what makes Becoming special is Obama’s candor and the exploration of just how hard much of it was, even as it was invisible to the public that has watched her for so much of her adult life. Both during her time at the White House and now in her post-presidency life, Obama has been a larger-than-life figure: she is the image of poise and grace; her marriage to Barack is romanticized as “marriage goals;”she is frequently asked if she will consider running for president (the answer is, and has been, no). But throughout Becoming, Obama pushes back against that image and repeatedly admits the weakness, doubt, and vulnerability she experienced throughout her life, addressing how she often turned to others in these times, whether through guidance from friends and family, marriage counseling, or being brutally honest with herself and others about her needs. With Becoming, Obama affirms that she is a voice, like her personal mentors were for her, “against the slights and indignities I was certain to encounter in the places I was headed—all those environments built primarily for and by people who were neither black nor female.” But she offers little to contend with the fact that the election of Donald Trump is a rebuke to the hope and positivity of the Obama presidency, a campaign predicated on the basis of racism. Perhaps her message is less unbridled optimism, then, and more of a recognition of the struggle to move the country forward that has always fallen to marginalized people. Obama acknowledges the current political climate, but doesn’t see it as foreclosing that something better might follow. As she poignantly said in a 2016 speech at the Democratic National Convention: “I wake up every morning in a house that was built by slaves. And I watch my daughters, two beautiful, intelligent black young women, playing with their dogs on the White House lawn.” Unlike the first ladies before her, Obama, whose “when they go low, we go high,” became a rallying cry in the final weeks of the 2016 election, has embraced optimism from a place of self-preservation as a black woman, as a strategy of survival. She is not calling for unyielding positivity, rather, for the kind of perseverance that’s necessary to survive. “I’ve lain awake at night, fuming over what’s come to pass,” she writes. But she continues: “What I won’t allow myself to do, though, is to become cynical. In my most worried moments, I take a breath and remind myself of the dignity and decency I’ve seen in people throughout my life, the many obstacles that have already been overcome.” Coming from a first lady whose ancestors were slaves—who has been reduced to the trope of an “angry black woman” and subjected to base racism, and whose husband’s successor rose to power on racist lies—Obama’s words carry weight. But just as Becoming is an account of the fears and uncertainty that she felt while fighting her own battles, the book makes room for uncertainty as we struggle to overcome the obstacles ahead.